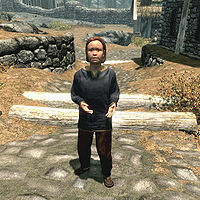 Children are young inhabitants of Skyrim that can be found in various places throughout the game world, most commonly in major cities and towns. They are not playable, and they cannot be killed. Only human races (Breton, Nord, Imperial, and Redguard) have children present in the game, no elven or beast races offspring are encountered. Cannot be harmed; the attacks only cause visual injuries and can make a child flee. Although children can be interacted with via quests, dialogue, and various games (tag, hide and seek), their most striking feature is that they cannot be harmed or killed. They also cannot be targeted for most other actions, including pickpocketing and feeding. Also, you cannot increase combat or destruction skills by using children as a target. Children will never engage in battle and will always flee at the first sign of a fight, however, if you use the Rage spell on a child they will engage in fighting. Children are present in the game world for increased realism and immersion but the game developers most likely opted for the "immortal" mechanic in order to avoid any "child-killing" controversy. For this reason, children were not included in either Morrowind or Oblivion (although the idea was brought up for the latter). They were finally featured in Skyrim; though, as stated, they are given special treatment. There are a total of 38 children in Skyrim (3 Bretons, 3 Imperials, 3 Redguards and 29 Nords). The Hearthfire add-on adds a total of 4 more children (1 from each of the four mentioned races). The Dragonborn add-on adds 1 more Nord child. †Deceased (or undead), either initially or as a result of quest events. ‡"Yes" means they can be adopted immediately. "No" means they can never be adopted. "If orphan" means they can be adopted if their parent(s) are killed. (They will be moved to the Honorhall Orphanage in Riften if this occurs.) Note that some parents may be essential and unkillable until after certain related quests have been completed. In the Creation Kit they are counted as a separate race, similar to how Dremora and the elders are treated. Despite being unkillable, children do have the "zombie grunt" and death sound files typical of humanoid reanimated targets. If you cast a spell near a child, he/she will respond by asking you to make them invisible. Unfortunately, you will not be able to do this (as there is no targeted invisibility spell in the game), so they will be disappointed when you refuse. You have the option to lie, and then pass a speech check (Lie). They will then begin acting like ghosts and start "finally having fun around here." There are some inconsistencies with the races of the children and their parents. Fjotra, a Nord child, has Breton parents, Enmon and Mena. Minette Vinius, a Nord child, has an Imperial father and an Imperial brother, Corpulus Vinius and Sorex Vinius, respectively. They might be results of an adoption. Adoption was originally developed as part of the Game Jam. All children in the game may appear in just their underwear. If you fast travel while playing a game of tag with children, it may cause the children to travel with you and wander off in random directions. Adopted children may disappear temporarily rather than showing up in their respective beds or just stand near their bed. ? Children who interact with certain in-game elements such as forges can scale up to adult size, and then become stuck in this state permanently.